There's a multitude of reasons why I love my brother-in-law Scott, AKA: Lui. For starters, he can ride a unicycle! 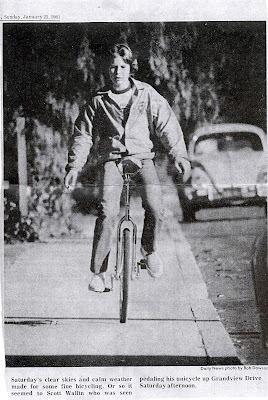 Back in 1981, he made the local Sunday paper for cruising around his neighborhood. Thumbs up Lui! Scott at thirteen, making unicycle riding look easy! I met Scott my freshman year of high school in Introductory to Physical Science Class. He has not changed much because he continues to act like a fifteen-year old, only taller with a beer in hand. He is playful, creative and quick-witted. For years we hung around the same group of friends and when I needed a date to the Sadie Hawkins dance, I asked him. 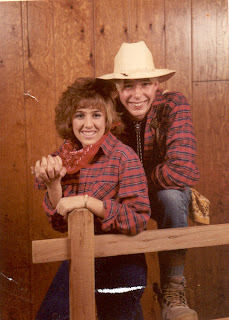 Off to the local Miller’s Outpost I went and bought us matching western shirts and styled my 80’s hair. A group of us went to the ho-down crammed in the back of a Bronco. Thumbs up to great memories! In college, my sister Miss Piggy, took a huge liking to my old friend, Scott. And visa versa. Have your heard that saying, “Friends are the family you pick for yourself?” She took my friend and literally transposed him into family. 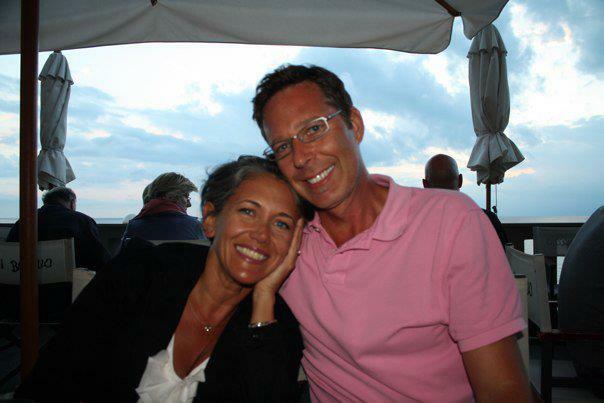 Scott and Miss Piggy married in Italy in 1995. These two are well matched in creativeness, humor and are the best of friends and lovers. Since she said, “I do,” my unicycle-riding-high-school pal is forever at family gatherings and is (one-of-two-of) the most fun and funniest Uncles (a Funckle) to my boys. Thumbs up! Scott will forever be our family’s one-of-a-kind Cabana Boy, Marathon Runner, Mexicano, Designer, Nerd and Dog Father. He started Spiffy Press and it is the perfect outlet for his immeasurable creativity because he has 20+ years of graphic design and printing experience. He comes up with ideas that are off the charts unique. Check out his work and you will see why I give it a GRANDE thumbs up! A big perk from Scott is that he brought his best friend, Dave, from college around my family. Alot. We were happy to have another Lui-type nearby, if not for pure entertainment purposes. Next thing you know, Scott's buddy Dave marries my other sister, Cutie Pie. These two create Baby Benson, "The Piece D'Resistance" of our entire family! Thumbs up for cute babies! Cutie Pie, Dave and The "B"
When Scott’s birthday arrived on February 11th all we could do was wish him happy birthday from afar. Miss Piggy, Scott and their dog-child, Cinco, vacationed at their beach house in Bucerias, Mexico for three weeks. Yes, you just read that correctly. Three. Weeks. Oh, to be their dog! They just returned Friday, so last night my Italian family gathered to shower Scott with belated gifts and best wishes. Oh, and to watch the Academy Awards. The game of the night was guessing who would win the Oscar and Aunt Cindy took home the prize for the most correct predictions. Thumbs up! Overboard cooked lasagna for fifty people, although only eighteen were eating. Mom is so Overboard! That is why we love her. Scott made his wish, blew out the candles and opened presents during the Academy Award commercials. My dad ... he refuses to own a DVR. He has run a successful sheet meal company for forty-three years and has never ever used a computer in his business. My father’s thirst for technology is drier than a Mormon wedding. Overboard holding Scott's ginormous dee-lish white-on-white cake. Confession: I ate two pieces. Scott gracefully adapted and opened presents one commercial at a time. Thumbs up for being a good birthday sport! What did we get Scott for his 44th birthday? I came across a ceramic “thumbs up” hand and immediately knew that this was created just for our irreplaceable Scott ... because we really, um, how should I say it? In the lingo of facebook, you could say we really LIKE him!